There are 4 trim levels to choose from: base XLT, Limited, performance ST,and top of the line Platinum. I choose Black of course. Its a nice spread of colors and ensures that there’s something for everyone. Not just basic silver or white. The standard engine is a 2.3 Ecoboost I4 with start/stop (which for me personally would be a deal breaker). It should also be noted that this engine is standard on the XLT and Limited. RWD is standard of course. If you want 4wd,its a $2,000 option. I didn’t add it because not needed. I’ve always found Ford’s option packages weird in their contents and naming. The standard option package is called 200A and is pretty much everything the XLT comes standard with. The only other option package at this trim level is 202A. For a steep $5,140 it adds things like second row consoles, LED headlights, chrome wheels, Co-Pilot 360 etc. Its honestly a lot more than just this but its too much to list here. Weirdly, if you don’t select 202A, an equipment group discount for $1,000 comes available that automatically selects it and takes a grand off the package price. There are a few other options as well. There’s a Class III trailer hitch for $710. The Co-Pilot 360 assist looks like it be had alone if you don’t select package 202A for $795 as its listed alone outside of the 202A package. But selecting the Co-Pilot package automatically selects the 202A package. There’s also a $90 smokers package. There are 6 exterior options. There’s a 20' wheel for $1,295. But again weirdly, selecting it you will find that this is part of package 202A. Why list them individually when you cant select them individually? Must be a Ford thing. LED fog lamps are listed but have to be selected with 202A as well, along with remote start....pretty much all the individual options require 202A. All in, a base XLT with the options selected will set you back just over $45 grand. $45,615 to be exact. Add 4wd and you’re even close to $50 grand. This trim also sees the availability of Ford’s Terrain Management System if you choose 4wd. Its described as: All-new Terrain Management System with Intelligent 4WD can help tackle any adventure with up to seven selectable drive modes through a single easy-to-use dial in the center console. This includes normal, trail, deep snow/sand, slippery, sport, tow/haul and new eco mode that each come with special 3D animated graphics in the new available 12.3-inch digital cluster. Should come in hand with those camping trips. There are the same exterior color options for this trim, so there’s nothing different there. The main differences with the Limited trim come when you get to the engine choices. The Limited trim comes with the option of selecting the 3.3 Liter Hybrid V6 for $4,150. I chose this option since it would be interesting to have an Explorer Hybrid. You can also chose 4WD with the Hybrid engine for $2,195. This trim also sees the option of leather seating in Black as well as a rear entertainment system for $1,995. 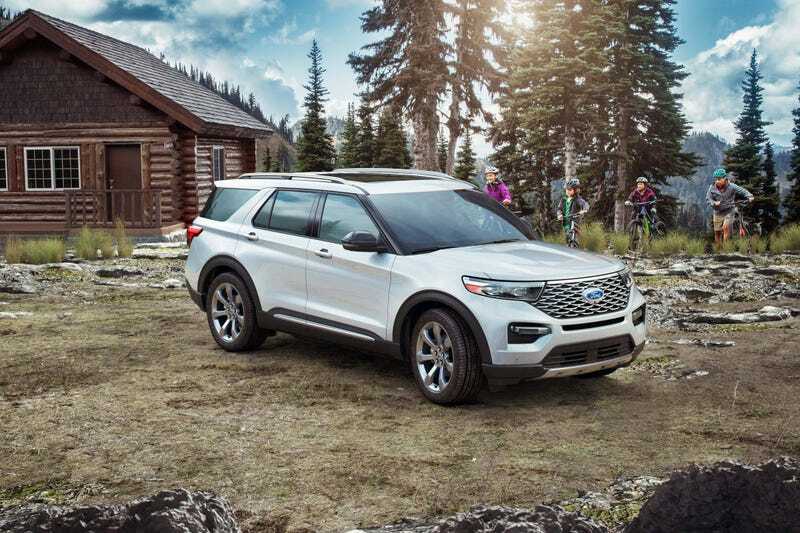 With the same options as the XLT selected as well as the hybrid system, awd and rear entertainment system, an Explorer Limited is an eye watering $59,260. And still just getting started. The ST surprisingly doesn’t have any trim specific colors, you can choose all the colors for the other 2 trims. I choose the blue which on the ST looks like BMW M Blue. Weirdly, Ford’s performance Blue that the Edge ST comes in isn’t available. AWD is standard with the ST trim as well. I added this. The second package is called the ST Street Package. For $995, its pretty much the Performance Package without the high performance brakes. Which means that you’re paying a grand for better brakes. You can only choose one or the other. I added this as well. All in with all options, an Explorer ST will set you back an insane $60,120. The Platinum trim comes standard with a 3.0 365 horse Ecoboost V6 as well as standard AWD. RWD isn’t available. With little to the same options selected, a Platinum trim will set you back $62,930. I had high hopes for the Explorer with the debut of a new rwd platform as well as the crazy ST trim, but at these prices, its going to be a nope from me dog. Combine that with the fact that this thing is priced into Aviator, as well as luxury marque territory, as well as Ford’s quality, and its a hard pass from me. What do you guys think of it?